Football is all about experiences, and arguably it doesn't get bigger than a match between Manchester United and Liverpool. 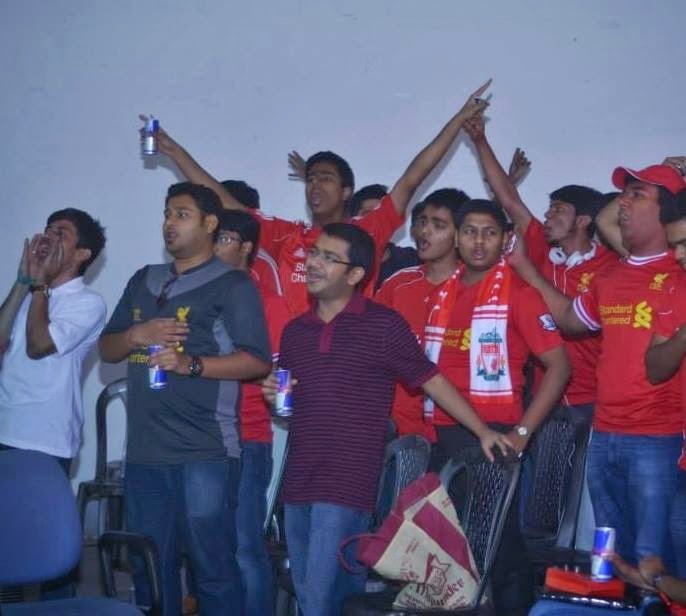 To have your fellow fans around you, cheering every tackle, groaning about every foul or celebrating every goal is a unique experience that doesn't happen very often, especially if you have been a Liverpool fan in the recent past. 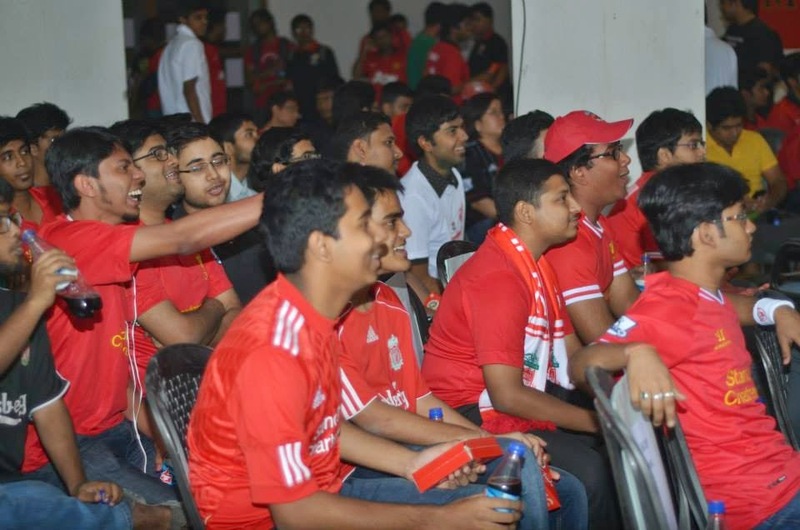 I have always wanted to have experience of being at screening, to cheer the team on to victory with fellow fans, and finally, I had the fortune of being able to attend the screening of the Manchester United vs Liverpool on March 16, 2014 during my brief visit to Kolkata. It was an opportunity to meet the fellow Kopites that I had the fortune of knowing via Facebook for the past year. 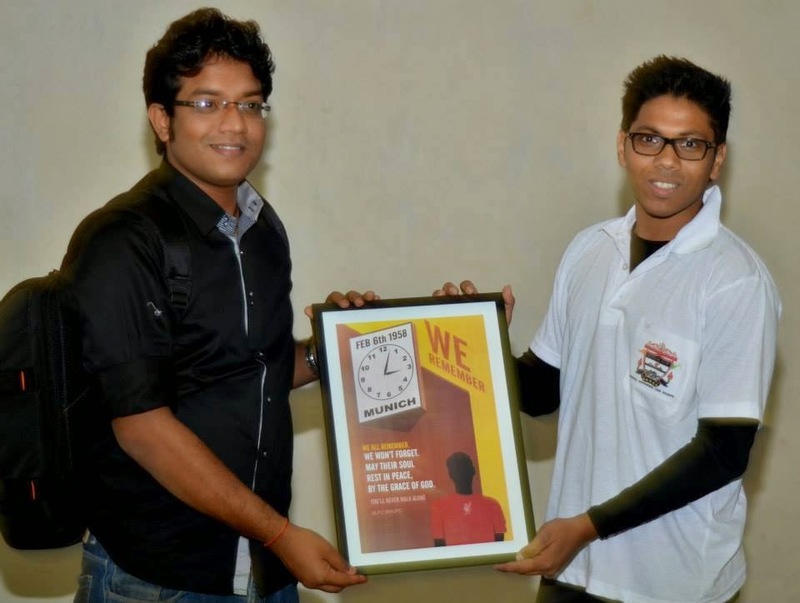 The screening, organized in joint collaboration of MUFC-K and Bengal Kop, was an opportunity that I was really looking forward to. One hour before the kickoff, and there was scarcely any seats available. The various compilations were playing before the game started, and one could hear the squeals of delight whenever there was the scene of a Luis Suarez or a Wayne Rooney scoring or the cheers when Nemanja Vidic or Daniel Agger went into a crunching challenge. It wasn't all about rivalry as both sets of fans showed their appreciation when the video about the Munich air crash played and there was unconditional applause from everyone present. However, as a Liverpool fan, my favorite moment before kick-off was when all the fans were up on their feet singing "You'll Never Walk Alone" in unison. The hair on the back of my neck was standing up as usual, and I guess for a few seconds, it felt as if we were there at Anfield, standing on the Kop while signing the anthem that unites all Liverpool fans. As the match started, rather than settling down, the atmosphere grew more heated - for every Suarez chant, there was a Rooney chant. Every ball was furiously contested by claims and counter claims and the mercury seemed to be rising. However, almost as a comic relief, the Liverpool supporters cheered every time David Moyes was on screen, something that even the greater number of United fans could not drown out. Finally the roof was blown off when Liverpool were awarded a penalty in the first half. The Liverpool fans were screaming for Rafael to be sent off for a second bookable offense with the handball while the United fans were religious in their support of their fullback. 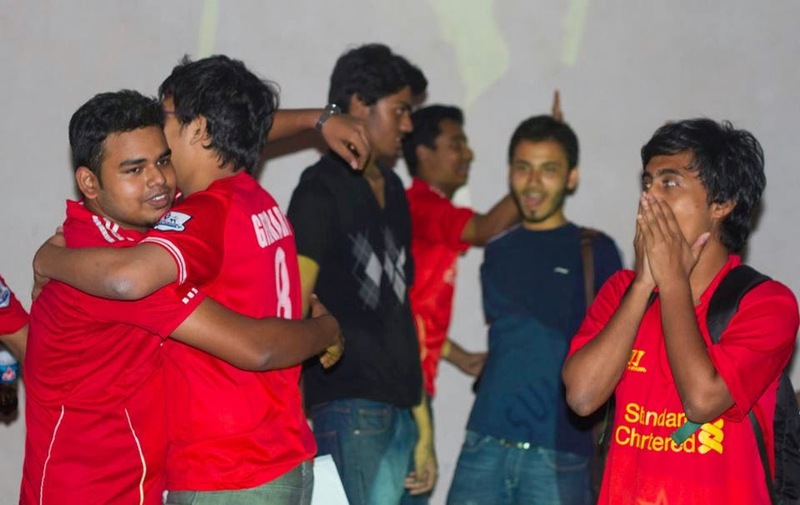 There was no doubt which way the match was headed once Steven Gerrard converted the penalty, and the Liverpool fans' joy knew no bounds. As time wore one, the result became increasingly obvious and with it, the volume from the United half went down and frustration began to rise. When Gerrard missed the third penalty, some sort of belief perhaps returned to United camp. There was appreciation from both camps when David De Gea made a brilliant save to deny Luis Suarez as the time was running out, the shouts of encouragement from the United fans increasingly became frustrated rants. Juan Mata was taken off close to the end, and the Liverpool fans cheered his departure with the same "Jai Mata Di" chants that the United fans had used for most of the game to show support to their £37m marquee signing. Matters got more embarrassing for the United faithful when Moyes decided to bring on Tom Cleverley as the Liverpool fans cheered his arrival as if they were celebrating a goal. When the final whistle blew, there was only one group which was willing to celebrate the result. While the result may have been quite one-sided, the experience would never have been complete without both the sets of fans, and hence despite all the animosity and ill-feeling between the two groups of supporters during the ninety minutes, things were always respectful in the end. The screening was one of the few experiences of my life that reinforced something that a great man once said. All pictures and video courtesy BengalKop.